My son has been having himself a wonderful time lately spending time playing the LEGO DC SUPER VILLAINS video game. Players create a completely customizable character who leads a team of villains to foil the evil plans of a interdimensional visitors intending to rule the world by impersonating super heroes. With the planet's actual heroes having vanished from the face of the Earth it is up to the planet's villains to save the day. How ironic is that?! So with all the fun he has been having playing LEGO DC SUPER VILLAINS, it was exciting for him to discover that some new content has been added to the game. As part of Warner Bros. celebration of Batman's 80th birthday, they have added a new level and playable mini-figure characters inspired by Batman: The Animated Series, the ground-breaking, Emmy Award winning series famous for its film noir aesthetics, intelligent and intricate stories, and stylized presentation. 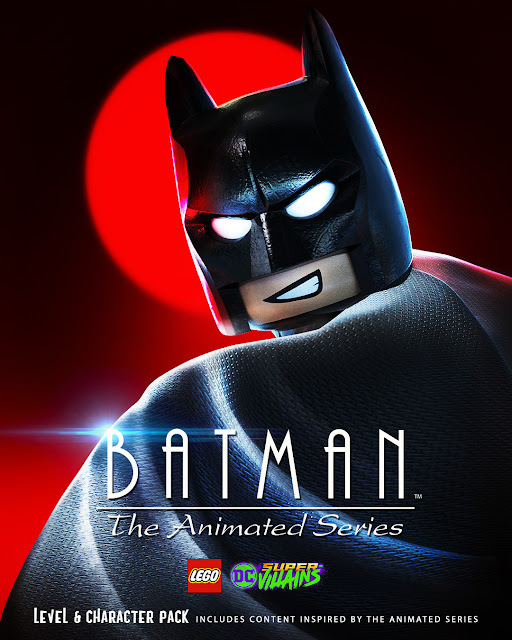 This additional content can be downloaded as part of the Season Pass which is included with the LEGO DC Super-Villains Deluxe Edition or can be purchased as an individual add-on to the game for $2.99. Known as Batman's main arch-nemesis, The Joker is an unpredictably nefarious criminal who uses every evil trick his mind can muster to try to destroy Batman and take over Gotham City. In Batman: The Animated Series, The Joker starts out completing criminal jobs for the mob and is cornered by Batman during an attempted robbery at the Ace Chemical Plant. He falls into a vat of chemicals disfiguring him and further warping his mind, giving birth to The Joker. While playing this BATMAN: THE ANIMATED SERIES LEVEL PACK for LEGO DC SUPER VILLAINS here is a great soundtrack playlist on Spotify to enjoy. Created by DC Comics as part of this year's Batman 80th anniversary celebration the playlist is surefire way to get amped up while playing the game. Stream Batman: The Ultimate Collection on Spotify to immerse yourself in the DC comic book universe while you play LEGO DC SUPER VILLAINS. For more information about how Batman's 80th anniversary is being celebrated in 2019 look for the hashtags #Batman80 and #LongLiveTheBat on social media. You can also visit www.Batman80.com for news and updates.